Mimicking the design conventions of contemporary spaces from high-end boutiques to corporate offices, Francis Olvez-Wilshaw interrogates the coding of their architecture, examining how it demarks space and dictates function. Through creating a visual schema of sculpture and surface, he reveals the objects and materials that make up our commercial environment to be infused with symbolism and hidden motive. 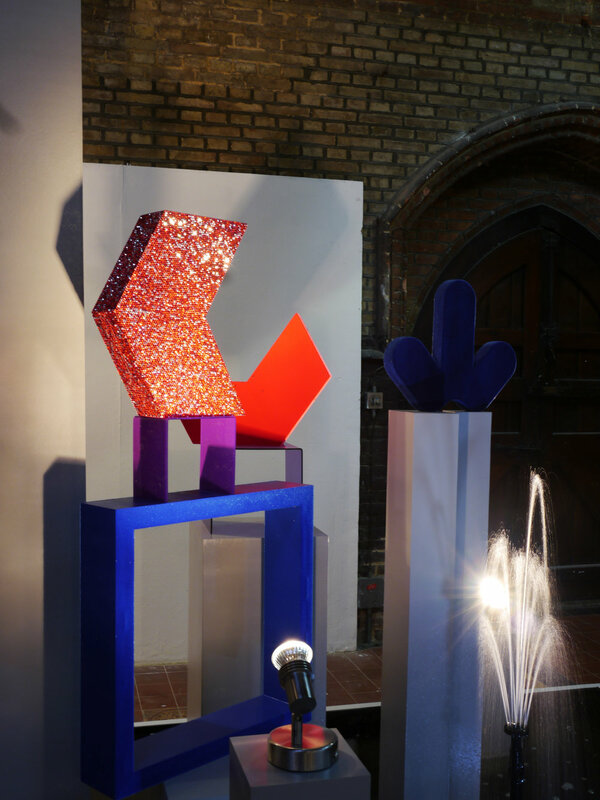 The slick brightly coloured sculptures Olvez-Wilshaw exhibited at the Winter Open stood like totems, emblematic symbols of our determined tribal devotion to consumerism. 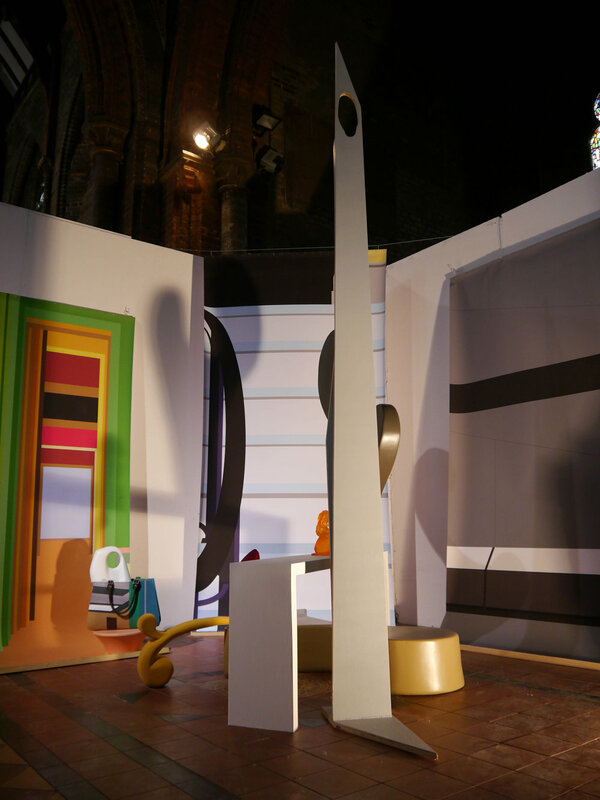 The designer objects used as inspiration were abstracted to the brink of recognition and re-fabricated. Shiny and seductive, they had the veneer of a model of success and yet their effect was to render that model empty and vacuous. The utilitarian and increasingly ubiquitous design of the corporate lobby is the target of Olvez-Wilshaw’s most recent installation at the summer exhibition. International company logos have inspired the sculptures but their recognisable shapes are parodied with slick surfaces and diamante decoration. They are displayed inside a water feature made of faux materials. This certificate of classiness, adopted by the discerning corporate developer, is extricated from its normal habitat so that we can unpick its design. In each installation Olvez-Wilshaw adopts the tactics of a commercial space to undermine them ultimately revealing how easily we are manipulated by our own surroundings. Winter Open 2015 (installation photo). Plywood, MDF, foam, flock, resin, leather, paper. Winter Open 2015 (detail). Plywood, MDF, foam, flock, resin, leather, paper.